In the subcompact premium hatchback segment, both Maruti Suzuki Baleno and Hyundai i20 are big guns. So deciding between the two, whether for used or new cars, is a vexing task. The two cars look pretty similar with respect to size and dimensions. They are both very good looking but have distinctly different styling. i20 has a more angular and chiselled look to it while Baleno comes across as more curvaceous. The facelifted i20 comes with a new front bumper giving it a more pronounced face and a sporty look which contrasts the earlier more matured looking versions. The Baleno has a smaller tail lamp and a larger boot space but the i20 followed the reverse path and comes with quite a pronounced tail lamp. The LED lighting pattern for the i20 has also been revamped from before which makes it look a lot smarter than the Maruti Suzuki Baleno. Various other features are shared by the two cars such as – daytime running lights, 16-inch alloy wheels, projector headlamps, LED tail lamps and both come with chrome offerings. The exterior design of Hyundai i20 wins brownie points because of its dual-tone offering which has impressed the Indian buyers. Now let us delve into the interior details of the two cars. Both are great cars with a lot of common features. Both have keyless entry and a start-stop button, automatic climate control and a state of the art touchscreen infotainment system. The features of the infotainment system include – Apple CarPlay, Android Auto, inbuilt navigation and the regular Bluetooth connectivity. The list of shared features by the two cars also include – reverse parking sensors and a reverse parking camera, albeit the i20 has a better camera interface in this aspect. Both have a single 12-volt charger but i20 has two USB ports compared to the one in Baleno and there is no doubt about its usefulness. The Maruti Suzuki Baleno comes with a glossy black surround and silver accent at its centre console while the Hyundai i20 is wrapped up in a dark grey and beige cocoon. The latter also comes a matching grey and beige interior while that of the Baleno is an all black trim. 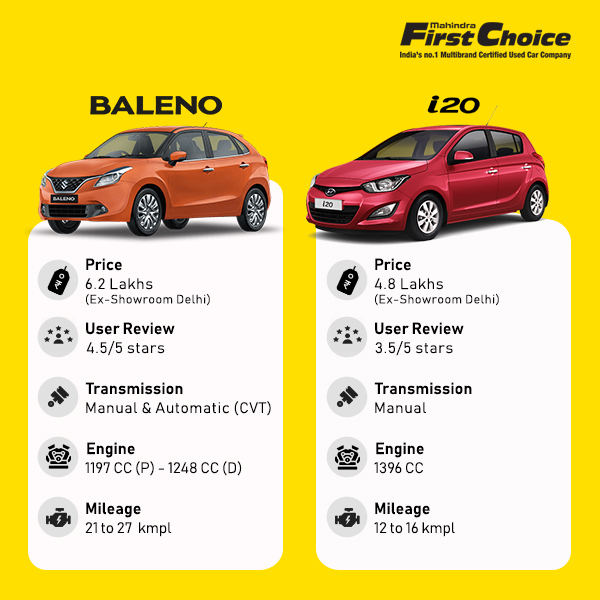 Both the i20 and the Baleno get diesel engines but the latter offers a more powerful variant. It is an RS version of a turbocharged petrol engine. There are also 1.2-litre petrol engines available in both the cars. The peak torque on Baleno is 83 bhp at 6000 rpm while that of the i20 is 82 bhp at 6000 rpm. The peak torque for both is at 4000 rpm. The Hyundai i20 also wins in terms of length of wheelbase – it is 50 mm longer than the Baleno. Both the cars are amply spacious with equally comfortable interiors and having similar boot space. So there is no clear-cut cue to settle the dispute. The Hyundai progeny is definitely better built with a nicer interior as compared to the Maruti Suzuki. The i20 is plusher with better feeling plastics. It also features a fold-down centre armrest which is a first of its kind in this particular segment. Previous Marazzo- Does It Make For A Value Buy In The Segment? Next Innova Crysta or XUV500- Which One Should You Pick?